Last week, U.S. Department of the Interior Secretary Sally Jewell and National Park Service Director Jon Jarvis toured the A.G. Gaston Motel, Kelly Ingram Park, and 16th Street Baptist Church before hosting a public meeting on a potential Civil Rights National Park for our National Treasure and its historic neighbors. The tour and meeting are important steps in the national park designation as it continues the vetting process for the Obama administration as the President's term in office is coming to an end. It is hoped that President Obama will utilize the Antiquities Act to create a park before he leaves if a measure passed by Rep. Terri Sewell (D-AL) is not approved by Congress by the end of their term. Christine Means Ellis, who was a foot soldier in Birmingham in 1963, came to Thursday's meeting to learn more about the proposed park. 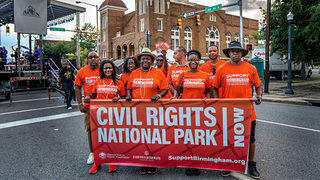 "It will give the younger people the opportunity to see what (the Civil Rights Movement) was about," she said, adding that she hopes the National Park Service will add listening stations for visitors and make the park engaging to children and teenagers. On May 3, 1963, Ellis, along with dozens of other students, walked out of Carver High School in Birmingham to march with King. They were taken to 16th Street Baptist Church where they shock the hands of King and the Rev. Fred L. Shuttlesworth and began marching two-by-two out of the church on their way to City Hall. Ellis, however, only walked about a block before she was arrested. "I never thought I would go to jail," she said. "It took three days for my parents to find me." You can read complete coverage of last week's events from AL.com and show your support by signing our petition here.